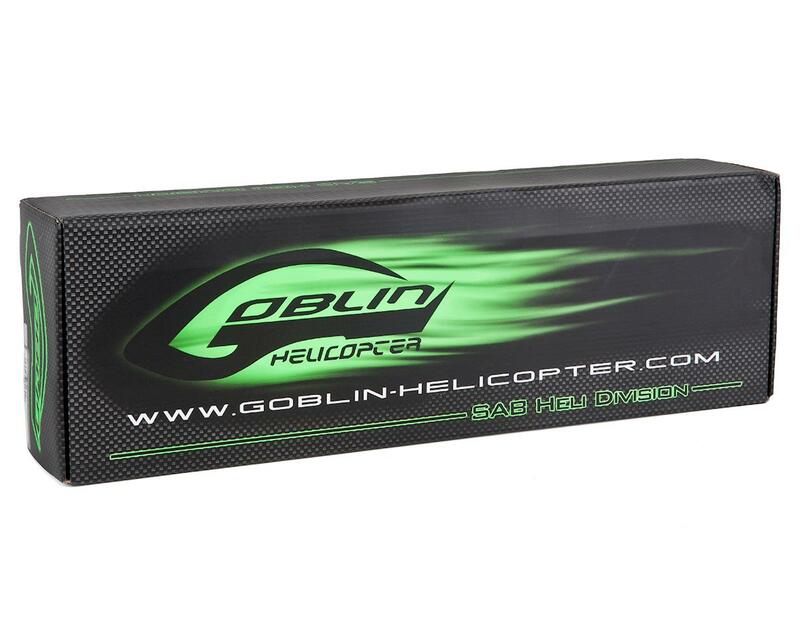 This is the SAB Goblin Black Nitro Flybarless Helicopter Kit. Featuring 690mm SAB TB "Thunder Bolt" Main, and matching tail blades pilots will experience a nitro helicopter like never before with flexibility from sport flying, to high headspeed, high pitch smack 3D flying. Additionally SAB designers have paid special attention to common nitro design features and request, and have opted for a physically higher than average engine, pipe, and transmission mounting which equates to a higher CG (center of gravity) to optimize flying characteristics. Furthermore the fuel tank is placed directly under the main shaft so that as your flight goes on, there is a minimal effect of throwing off the CG from the beginning of the tank to the end of the tank. Moving into the nitro market allowed for additional improvements and advancements to the nitro design styles, and overall experience with the model. With that being said SAB has opted for a simplistic installation, and removal of the engine unit. The engine unit can be installed or removed in minutes as it only utilizes 4 bolts for mounting into the frames. No accessory components such as the muffler, or fan shroud need to be left off or removed for installation, or removal of the engine unit to the Black Nitro, making the build and further maintenance a breeze. The same user experience is in mind in regards to the fuel tank, and fuel system. The tank is held in by 3 bolts, and will allow pilots to quickly install, remove, inspect, and replace any items needing attention in a timely and painless fashion. The patent pending horizontal servo mounting system directs servo torque directly to the flybarless main rotor system via short, stiff linkage rods that rotate via bearing raced support. This system is strong, allowing power transfer to be as direct as mechanically possible, resulting in precision and rigidity that is simply unmatched. 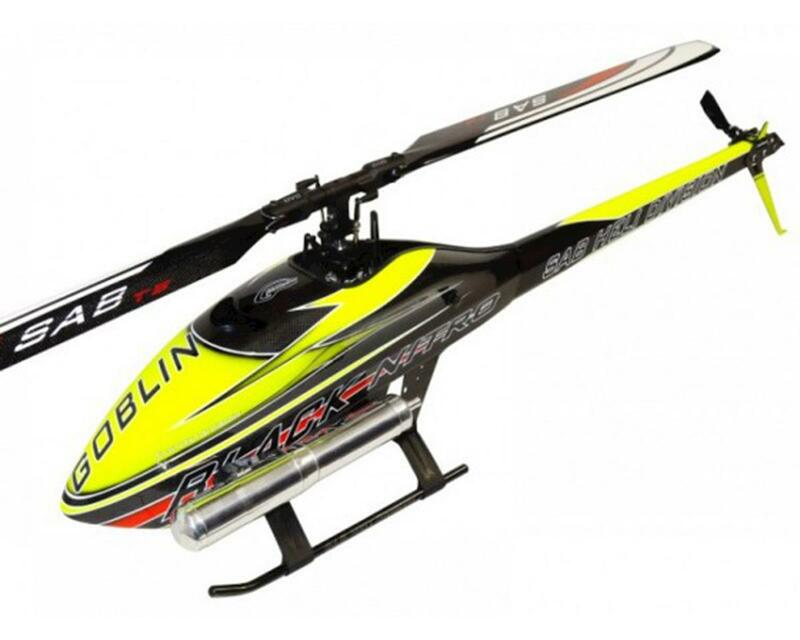 SAB Thunder Bolt Rotor Blades: Thunder Bolt blades are a drastic redesign of the older Black Line blades SAB offered. The TB Blades feature a variable profile and chord width from end to end, allowing for optimal lift at each critical point of the blade. This allows the TB Blades to be up to 20% more efficient than the Black Line blades. The tip of the blade has also been changed, to that of a tapered style which allows for increased efficiency, and lower noise due to lack of wasted energy in flight.